Growth factors are naturally occurring proteins in nature. Often, they are used as a cure for periodontitis. These proteins help the body to grow during normal growth and development, wound healing, and tissue repair. Some of these factors were first identified in the laboratory and have been made available commercially, through techniques called recombinant DNA technology. The DNA or ‘blueprint’ for almost any protein can be determined using standard techniques. These techniques allow those same DNA sequences can be cut, sliced, and transferred into another organism, usually a bacteria or yeast strain that is easily grown. The ‘transfected’ organisms are then grown on a large scale under ideal conditions in a commercial laboratory. Here, they can be harvested and then purified into a concentrated mixture. 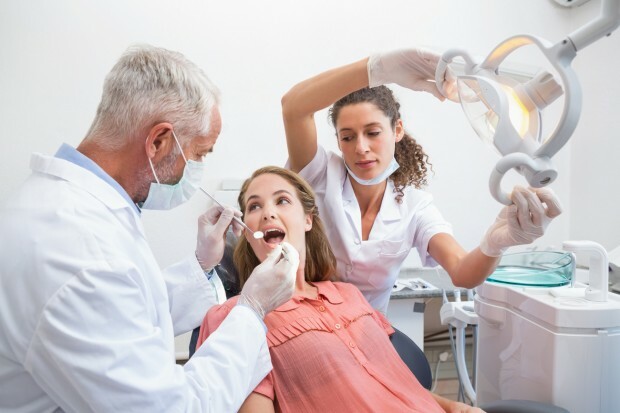 The purified proteins are made commercially available to the dentist or physician to use during regenerative surgical procedures to help ‘kick start’ bone and other periodontal cells into a growth mode. The results of clinical studies using these growth factors for periodontal regeneration while good, have not been overwhelming. Also, there is considerable variation in the results obtained. It is not certain whether these regenerative procedures will actually work for your particular case. Another drawback has been the added cost of these growth factors and regenerative materials, which routinely add hundreds even thousands of dollars to the cost of surgery. Ironically, all of these regenerative materials are already present in our own bodies (for free). The problem has been how to get them in the places they are needed and when they are needed. A once popular technique, that is still used by some clinicians, derives a concentrated mixture of these proteins from the patient’s own blood. The patient would donate a few test tubes of their own blood, that would be processed in the dental office using a laboratory centrifuge. A centrifuge is a laboratory instrument that can spin at very high speeds, using centrifugal forces to separate the blood components based on their molecular weight. The test tubes of blood contain specific chemicals to help concentrate the blood proteins are spun around until the desired proteins could be drawn out and then placed into the desired periodontal defect site during surgery. While some clinicians get good results for their surgeries using this technique, the results have not been dramatic for many patients. Additionally, laborious blood concentration procedures result in limited usefulness of this blood derived concentrated plasma. Is there a better way to use the body’s own growth factors?